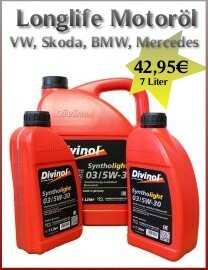 Divinol Syntholight FE 5W20 is a modern engine oil of SAE 5W20 class. DIVINOL SYNTHOLIGHT HC-FE 5W-30 is a smooth-running engine oil made by use of the most advanced HC synthesis technology.It is based on additives with low ash content (low-saps) for application in the most modern spark-ignition and diesel engines. Divinol Syntholight CC 0W-30 is a smooth-running engine oil blended with most advanced HC synthesis technology oils and modern additives. Modern engine oil based on special base oils and additive components for use in Ford ECO BOOST engines.